In this vibrant exhibition Alison's work focuses on the specific subject of meat � large, uncooked slabs of it! 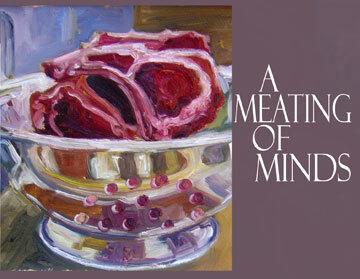 "Painters like Manet, Rembrandt and Chaim Soutine spent a lot of time exploring meat as a subject matter. Soutine in particular produced paintings where the meat was very thick, luscious and bloody," says Alison. "Oil paint is fantastic for portraying meat as it has such great texture � it's really �meaty'." As usual Alison's work is quite contemplative and, although there is a variety of other objects � from whisks to colanders � in the paintings, it's really all about the meat. "Meat is a very contemporary subject matter � there are a lot of people questioning the ethics and sustainability of meat-eating right now. But whatever the rights and wrongs of it, as a painter I can't help but revel in the dark beauty of meat."